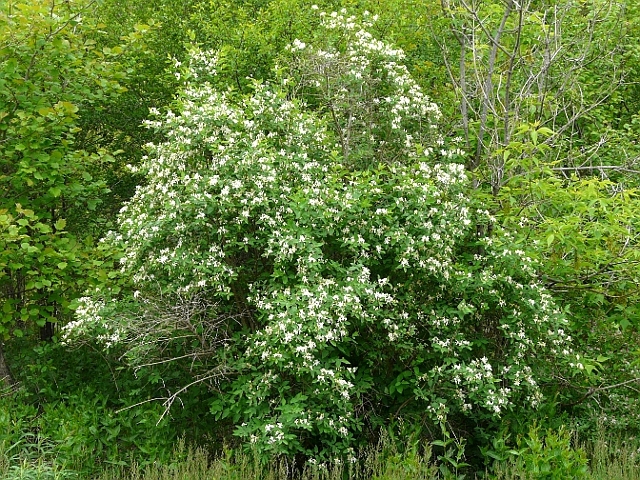 Follow this link to the iNaturalist field guide for Shrubs of Winnebago County! Amur Honeysuckle (Lonicera maackii) is native to Manchuria, Japan, Korea and China. It was first introduced into the U.S. in 1855. It was originally planted in the U.S. as an ornamental shrub, but it quickly escaped gardens and naturalized throughout much of the eastern U.S. to the Great Plains into a variety of sites including roadsides and railroads, woodland borders, some forests, fields, unused or disturbed lands and yard edges. Once spread into the wild, it can form dense, shrubby, understory colonies that eliminate native woody and herbaceous plants. 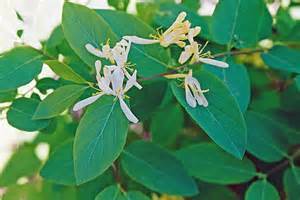 It can grow up to fifteen feet tall with medium to dark green leaves and tubular, two-lipped, fragrant white flowers that bloom in May and June. It’s dark red berries are inedible to humans, but a favorite of birds who help spread the seed. Grape Honeysuckle (Lonicera reticulata) is a climbing or sprawling plant that is native to much of the Midwest. It produces a whorl of five to eight pale yellow-orange flowers in the late spring that ripen into grape-like clusters of bright red fruits in the fall. Hummingbirds, along with many species of long-tongued butterflies, bees, and flies, pollinate the flowers. 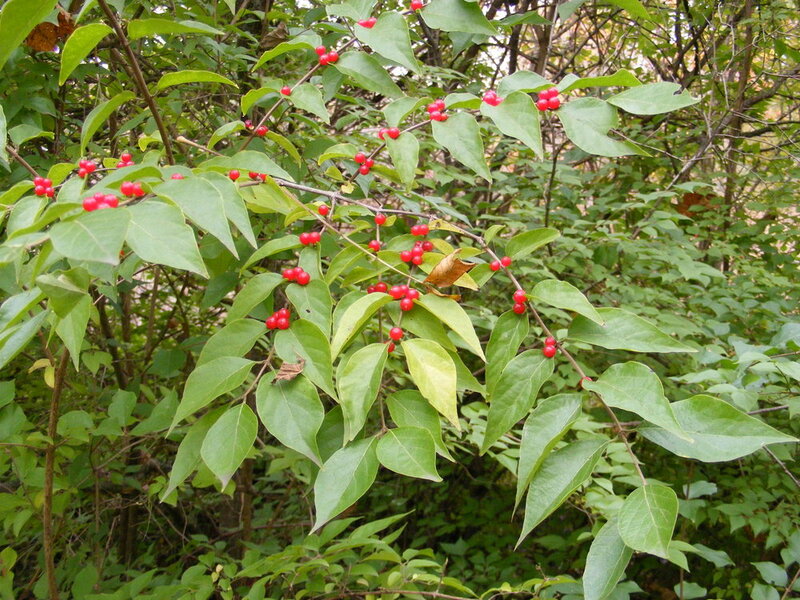 This fast-growing plant can provide shelter to nesting birds (which also eat the berries), and a food source for deer. Many species of caterpillar also feed on the foliage. 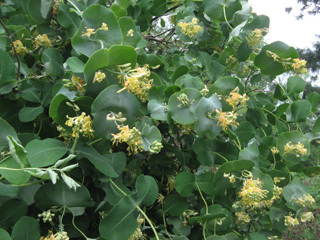 The leaves often form a bowl or cup-like structure around the flower cluster. Red or Trumpet Honeysuckle (Lonicera sempervirens) is a twining woody vine, usually climbing on other vegetation but sometimes trailing along the ground. It can grow ten to fifteen in length, its older stems covered in papery brown exfoliating bark. Large, non-fragrant, narrow, trumpet-shaped flowers are scarlet to orangish red on the outside and yellowish inside. Flowers appear in late spring at stem ends in whorled clusters. They are attractive to hummingbirds, butterflies and bees. Inedible red berries form in late summer to early fall and can be ornamentally attractive. The small red berries are attractive to birds. Oval, bluish-green leaves are hairy beneath. 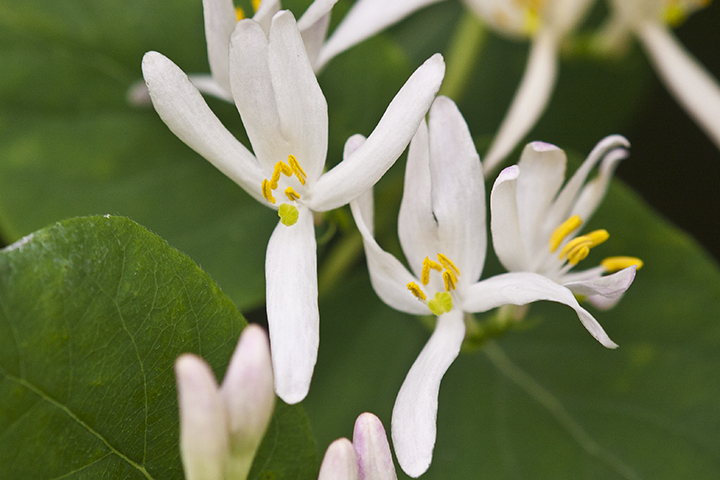 This variety of honeysuckle is native, often found along stream banks and in thickets. Morrow Honeysuckle (Lonicera morrowii) is a multi stemmed, upright, deciduous shrub that grows up to eight feet tall. Its bark is light brown and has hollow stems, which can be somewhat hairy when young. 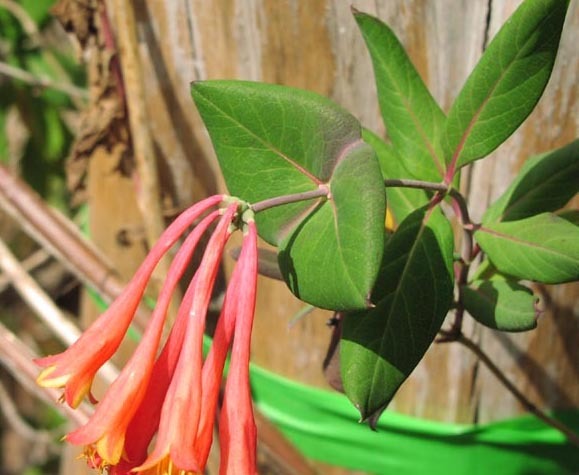 Morrow honeysuckle has grayish green leaves that are between two and three inches long with a hairy underside. Its flowers are paired, tubular, white to cream-colored, and found from May to June. Its fruit ripen to orange or red in color and can last throughout the winter. 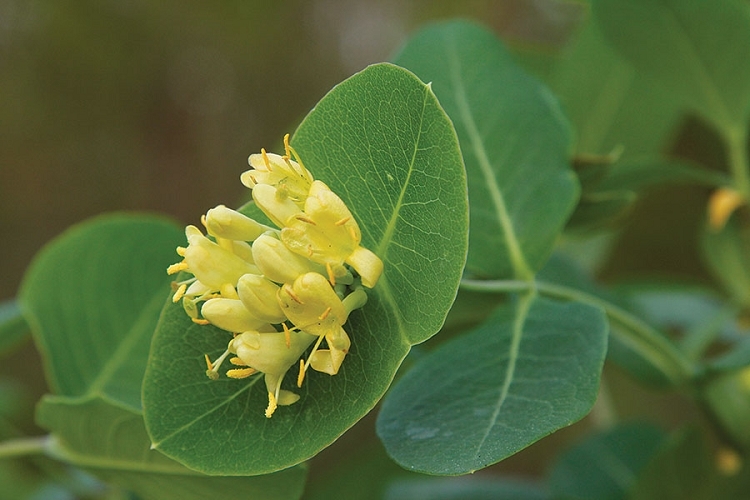 Morrow honeysuckle is highly invasive and occupies woodlands, fields, and other disturbed sites. Its fruit is popular among birds and mammals, who help distribute the seeds. 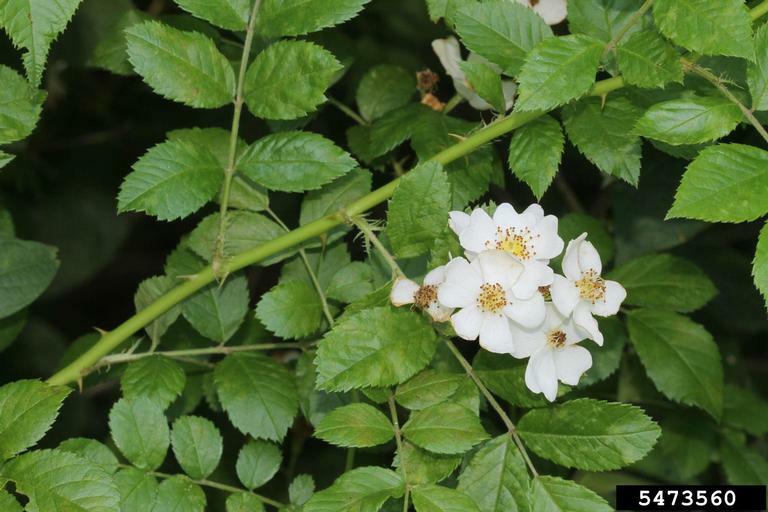 Multiflora rose (Rosa multiflora) is an invasive species originally brought over from Asia for land conservation measures in the 1700s. This climbing shrub can quickly overgrow native understory plants and reach a height of fifteen feet. 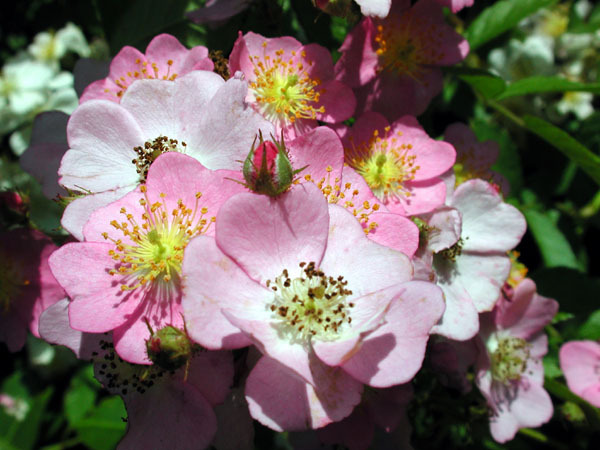 The white to pink flowers range in size from the width of a finger to four centimeters in diameter and bloom in the early summer. Its leaves are divided into five to eleven sharply toothed leaflets with curved thorns at the base of the leaf. Small, bright red fruits or rose hips develop mid summer. Tatarian Honeysuckle (Lonicera tatarica) is an Eurasian species is a highly invasive shrub in the US. It is known to reach nine feet in height, with oval-round leaves three to six centimeters long. Tatarian honeysuckle flowers most often come in a pair of white, pink, or red color less than two centimeters in length. The fruit is a small, shiny, red berry less than a centimeter in diameter. It is known to form dense thickets that spread quickly, as birds love to eat and distribute the berries. While a favorite of birds, the berries are not edible for humans.